The Castell Trapped Key Interlock MBV is designed to operate as part of an integrated safety system controlling the operation of quarter turn ball valves in safety critical applications. The typical application of the MBV modular ball valve interlock is preventing unauthorised closing of one of the lines ensuring that one line is always open. Interlock valves in both open and closed positions have an interchangeable key between the valves ensuring that the first valve is open before the second is closed. While the operational line is locked opened, the service line is locked closed. Prior to opening the service line it needs to be ensured the operational line is locked closed. 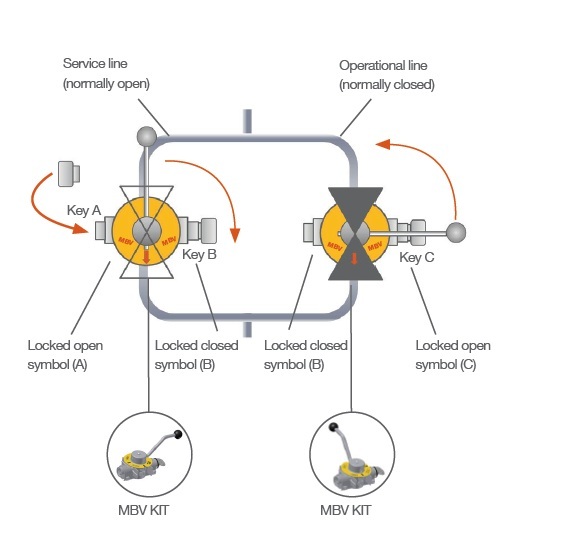 By inserting key A (from control room) in the MBV, which controls the operational line, you can unlock the valve and bring it from opened to close. By turning and releasing key B, you can lock the valve in the closed condition. Key B can be taken to the next valve, which controls the service line. This valve can now be unlocked by inserting and turning key B in the MBV. The valve position can then be changed from closed to open and locked in the opened position by releasing key C. This key can then be taken to the control room.